An owl skull. Owls look cool, but I haven't seen many out on walks. 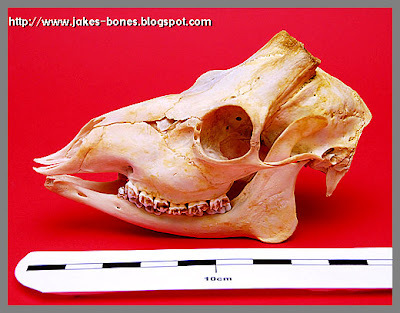 A complete sheep skull. I have four sheep skulls already, but none of them have all the parts - the skull, the two horns, and the two parts of the lower jaw. 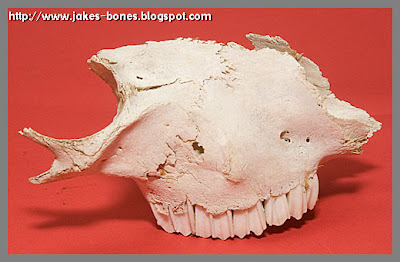 A cow skull. This would be the biggest skull I have yet. A red deer skull with more than 8 points. The biggest deer skull I have at the moment is this one which was 4 + 2 points. 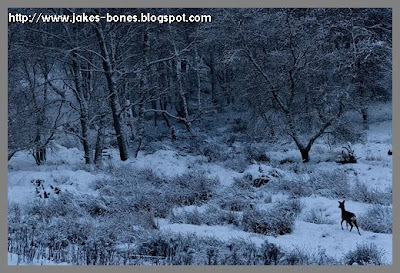 It would be great to find a skull with bigger antlers, but it is difficult because gamekeepers or poachers take skulls with bigger antlers because they are valuable. This week, a red kite just like the one above was shot in my village. Luckily someone found it and it's still alive. 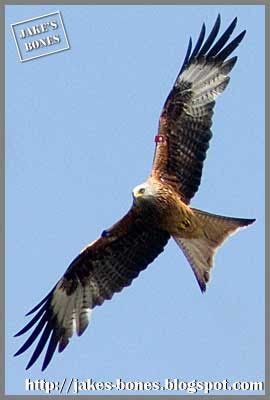 There used to be loads and loads of red kites, but about 100 years ago they had almost gone. Now people and trying to bring them back to Scotland. Near my village, I think there were two red kites nesting. 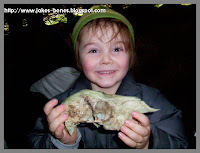 I found this skull part in a wood called Tam Breck wood. It was in two pieces, broken down the roof of the mouth, but Dad glued it back together. I found it in about March. This post is one of my ten most popular articles. This might be one of the coolest bones I have. 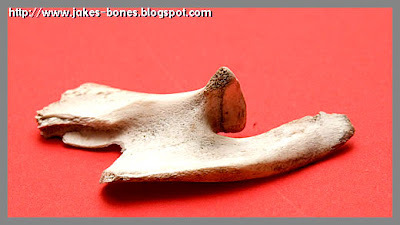 I found it in a private deer wood just a few miles from my village, and there's probably not another bone like it. That's because it's three broken bones that have been healed together. It's from the front left leg of an adult red deer. Here's it next to the front leg bone from Alice, the year-old red deer hind whose skeleton we found a few months back. Today, Dad and I went back up to the Secret Vault. 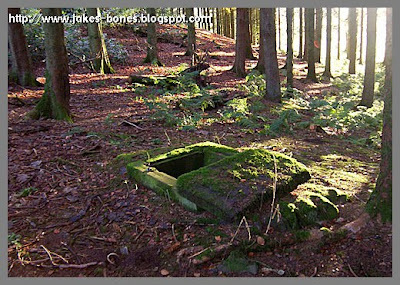 It is a secret underground chamber in the middle of a wood that we found by accident ages ago. When we first found it I was on a walk with Mum and Dad and I could see bones at the bottom of it, but we couldn't reach them. 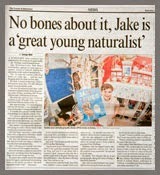 I thought one of the bones was human. Yesterday me and my dad were walking in a deer wood and we found this on one of the tracks in two different places, both where the track was next to a stream. It looked like jelly and one lot had a leaf inside it. Around it were a deer's tracks, maybe of a young red or a old roe (this wood has both roe and red deer). 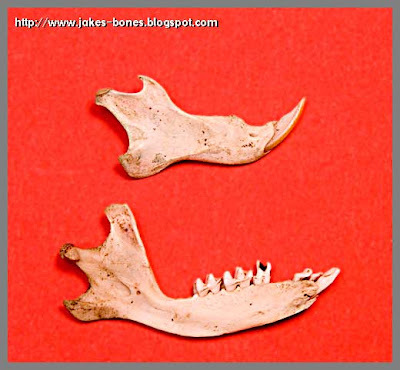 I've got two jaw bones from small animals to clean up. The top one I found in a wood while on a walk with mum and dad, and I think it is a squirrel jaw, but I'm not sure. The other one I think is from a hedgehog. My friend Holly found it on the road which goes up to the castle in the village. 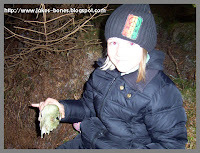 One night my dad and I were coming out of a wood late at night and we found a hedgehog. My dad picked it up in his hat so we wouldn't get spiked. It was cool and I wanted to keep it as a pet but daddy said no. If I had a pet fox, I'd call it Guy Fox. Here's the six point red deer skull that we found back here. At the start, this skull was really really dirty because it was buried under the ground with only one antler sticking out. It took us weeks to clean up, but it was worth it. Dad's put woodstain on the antlers, and it now hangs on my shed, next to two other red stag skulls. 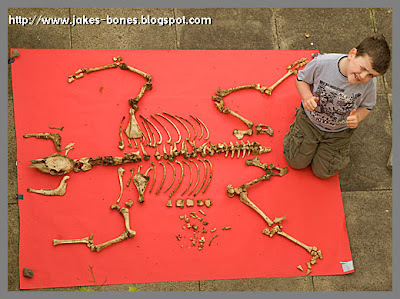 Important: This blog post from 2009 is now out of date because I have written a much bigger and better post about everything I know about cleaning bones from five years of bone collecting. 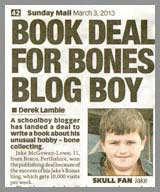 You can read it by clicking here or by clicking on the "Cleaning bones" tab at the top of every page. Most of bones I collect are mostly clean already, because all the flesh has been eaten off them already by animals and bugs. But they all need cleaning up a little bit, and this is how I do it. This is how I cleaned up the skeleton of the red deer that I found here. 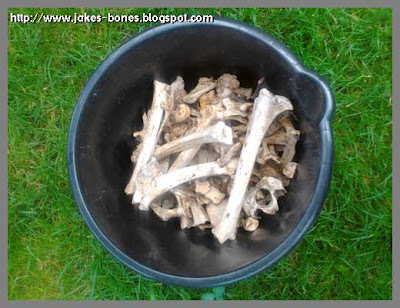 After I brought back the bones, I put them in a bucket to store them. This is about half of them. All together, the bones filled this bucket. There were 157 bone parts in all. The splitroe buck skull has been in the peroxide for a week (together with the young red deer). The peroxide cleans up the bone and makes it white. I was careful to only put it in the peroxide up to its antlers so they didn't go white. Here's what it looked like when in the peroxide. 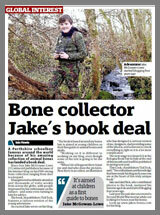 I've been really lucky on walks recently, and have a load of new bones to work on. Here are some of the ones I've found in the last month or so. I wrote about finding this here. I've cleaned up the sheep skull, and it now is on my shelves in my room. 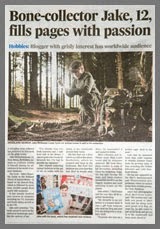 I'm going to write more about it later. I never found the other horn or the other part of the jaw, which is a shame, even though Daddy went back to try and find them. It would have been great if we had all the bits. But it's still the best sheep skull I have, and I have four. 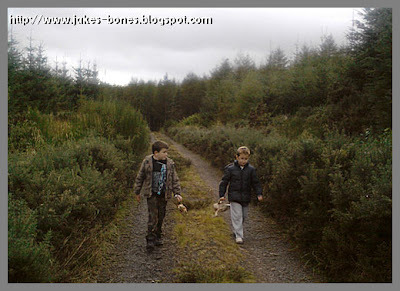 This is me and my friend Innes this evening coming out of one of my favourite woods, where there are roe and red deer. 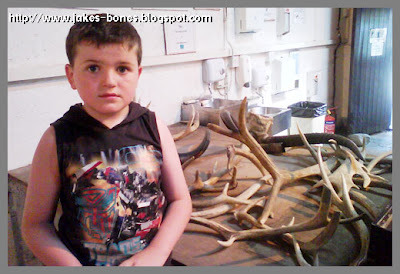 We found a roe deer buck skull with six points (I'm holding that), a red deer stag skull with very soft antlers (Innes is holding that), and a red deer stag skull with four points on one antler and two on the other, which you can't see because my daddy was holding it and he was taking the picture. 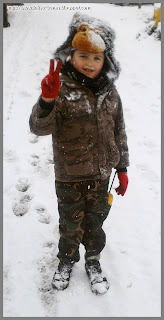 Most of the six-pointer was buried and we had to dig out of the ground and it took my daddy ages. We have to share the skulls but we haven't decided who is having which ones yet. Today, we found this dead fox by the side of the main road that goes through my village. We think it must have been hit by a car. I love foxes. Farmers don't like foxes, and I can see why, because they kill the farmer's animals like chickens and lambs, but I still think they are lovely creatures. 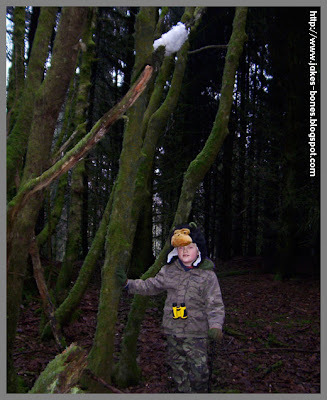 What you can see in the picture above is a red deer skeleton that we found on a walk last night. (We've called it Alice). 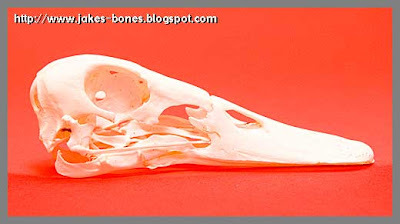 We know it's a young female, but we still have to do a proper look at the bones. 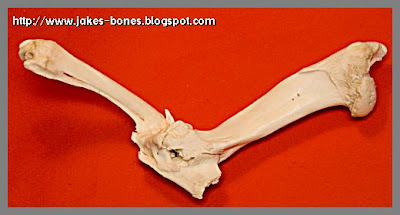 There are 157 bone pieces altogether, but some of those are from big bones that are broken, and some of those are tops and bottoms of bones that in older deer are joined together. 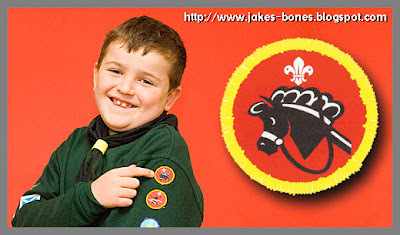 This week the weather has been better, so after school I have been on two bone walks again. 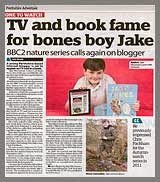 Two days ago I went a bone walk to Tam Breck wood with daddy. My dad saw a roe buck but it ran away fast do I didn't see it, and further on we saw two roe in the fields. Then we found this rabbit skull. 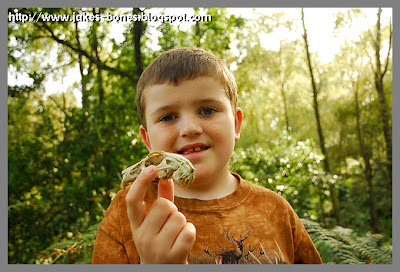 The first bones I collected were rabbit bones, and I still collect them if they're good enough. 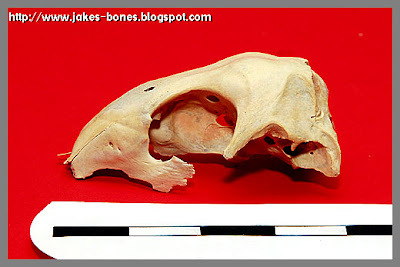 I have about ten rabbit skulls, and it's really easy to find lots of them, but not many are in good condition like this with all the teeth, the nose bones, and the brain case. That's because whatever kills them, like a fox, often bites the skull as well. 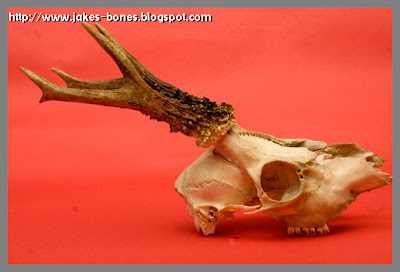 Daddy and I were planning to go on a deer stalking walk today, but it was raining, so Daddy said maybe I could put one of my old deer skeletons together. I was going to do a baby roe deer skeleton, but we couldn't find all the spine bones, so we did this adult roe deer instead (we call it Eddie). You can see how I sorted out the bones. There were 66 bones for this roe deer, which seems like a lot, but it's not a complete skeleton, and most of these were the ribs and vertabrae. When we found the skeleton, most of the front legs were missing, and there are other bones, like the toes, which we brought back but must have put in a different box. I started with the spine first, putting a wire through the bones so they all stayed together in the right order. 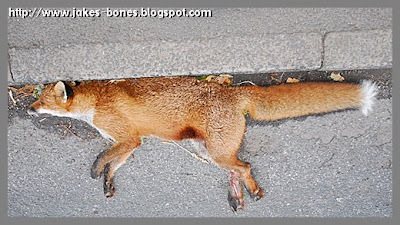 Important: Are you looking for a step-by-step guide on how to put a fox skeleton back together ? If so, I wrote this guide in January 2013 which is more help than this page. 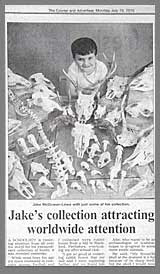 I used to think that if I found an animal skeleton all the bones would be in the right order. 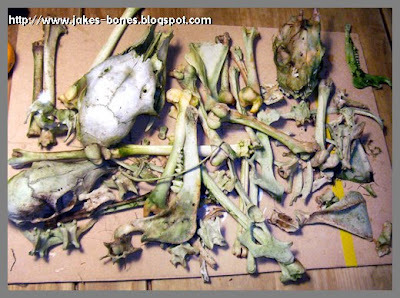 But in most of the skeletons I've found the bones are all jumbled up, and often bones are missing. That means that if we want to know more about the animal, we have to try to put the pieces back together. 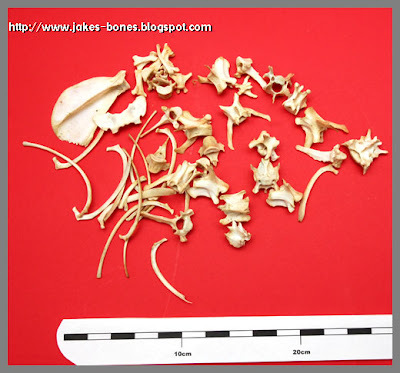 Here are bones of a fox that I collected. When I put names to my skeletons, I called this one Harry. 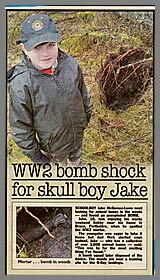 I found the skull first of all, then we looked harder, and we found some other bones which were buried beside it. 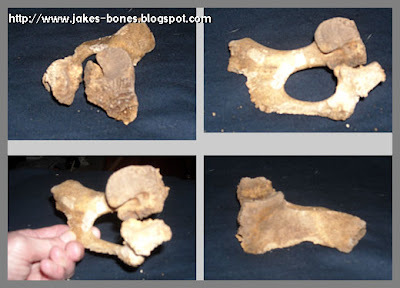 Here are the bones we found. You can see they were all jumbled up when we brought them home. Different types of bones have different shapes, so then we begin sorting them out. Even though we this was the first fox skeleton we brought back, we could see that a lot of the bones were just the same as a deer or a rabbit. We began by sorting them into different piles. Six weeks ago I found a dead sheep on a moor while exploring old farmhouses with Daddy. It was already being eaten by foxes when we were there - we scared away one. That was on the 13th July, and we thought it had maybe been there a month. We went back this evening, and it was already rotted down to the bones. 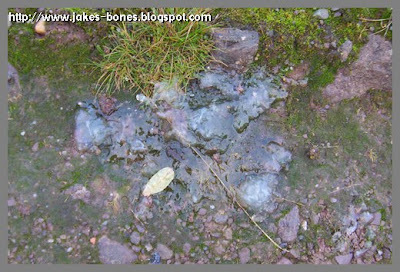 The bones were spread over a really wide area - we found one of the legs about ten metres from the rest of the body. We found the skull, but only one of the horns, and only one of the lower mandibles, so it's not perfect, but it's still the best one of the four sheep skulls I have. While we there, there was a storm, so we stopped searching and came back off the moor. I'll clean it up, and write about it here later. 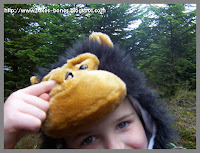 On Thursday, Daddy and me went to the D'Arcy Thompson Zoology Museum at the University of Dundee. It's normally open to everyone on a Friday afternoon during the summer holidays, but we arranged a special visit because we couldn't make it on a Friday. The museum was small, but it was good. Here are the top ten things that I liked there. A warthog is a kind of wild pig that lives in Africa. It has tusks, just like an elephant. 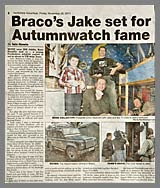 This is me today at Auchingarrich Wildlife Centre which is not far from my house. I saw roe deer and red deer and fallow deer and there were supposed to be Chinese water deer, but I couldn't see those. 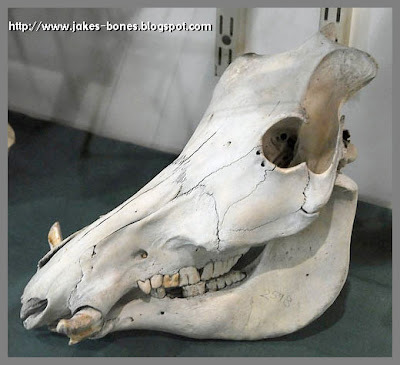 There was also a cow skull and a goat skull. The cow skull was massive. I would really like one of those. Yesterday, me and my Dad went on a walk to explore a red deer wood near our house. It was a nice day and a really good walk. I'm getting much better at spotting deer, and learning to walk quietly so we can watch the deer without frightening them. 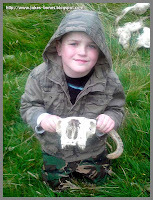 We found two red deer skulls,both of which were very old, and one of which was smashed so we didn't bring them back. 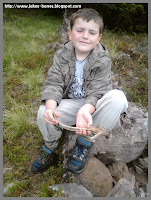 We also saw six red deer and a fox, but the best bit was finding this antler. This is a very unusual antler. It is unusual because it seems to have three branches at the bottom. We haven't seen any other antlers shaped like this. Normally, deer antlers have two branches at the bottom. 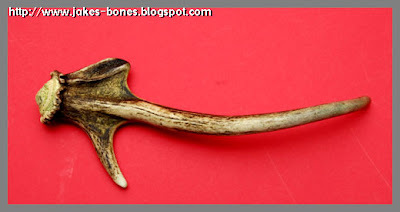 Here's the new antler next to an old, four-point antler in my collection. 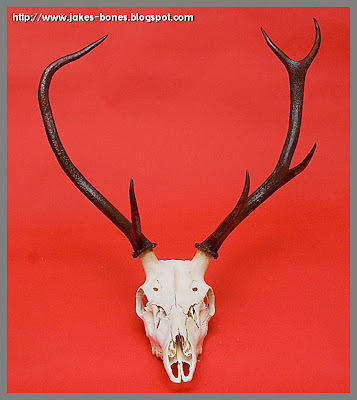 This is still one of my favourite skulls, even though I now have lots of other roe deer skulls. I found this roe deer skeleton while out walking with my dad in the Pheasant Woods near my house, and we discovered it after I saw my first ever roe deer for real.